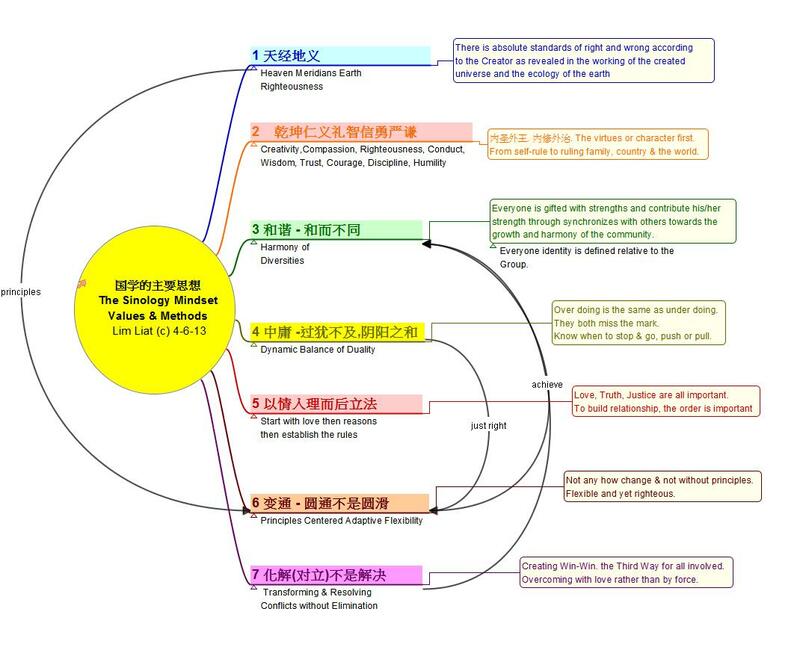 The Essence of Sinology, or the Chinese Mindset of Values and the Methods to achieve those values are shown in a mind-map below. The 6 values and methods are righteousness of created order, harmony of diversities, dynamic balance of plurality, from love to reasons to laws, principles centered flexibility and transforming resolution of conflicts. Such values and methods are the keys for peace and abundance for present and future world of diversities. The most challenging issue facing today is the diversities of demographics and cultures being brought together in close contact. The behavior of one will greatly impact the others in this connected world. This impact is further intensified by speed of information exchanges through social network. Many keywords become popular recently such as inclusivity, tolerance, balance, diversity and acronym like VUCAD (Volatility, Uncertainty, Complex, Ambiguous, Deception). I believe that the Sinology, Chinese Classical Philosophies, provide the answers for the today world to achieve peace and meaningful abundance. It is of course important to note that the present day Chinese, whether in the main land, Taiwan or in overseas, do not fully possess such classical values. Many Chinese, especially those overseas, have been educated with and in the Western schools, universities and corporations. So, they may have some but not many of the proposed values and methods. Nevertheless, some of such values do filter through the traditions and festival celebration practices. What are being proposed are therefore my version of the Classical Chinese Philosophies ideals and are shared for your consideration. This entry was posted in Confucius, I-Ching, Sinology and tagged Sinology by limliat. Bookmark the permalink.